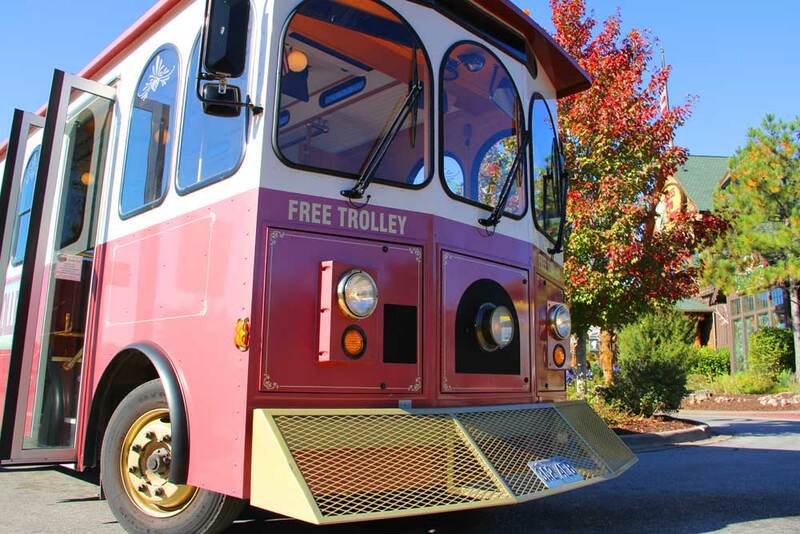 You want to explore Downtown Branson, and you’ve heard about Branson’s free trolley system. Here are the Frequently Asked Questions (FAQs) with everything you need to know. Where can I go on the trolley? The trolley system has 13 stops throughout Downtown Branson, including Main Street, Branson Landing and the Branson Convention Center. The stops are divides into two routes, the Orange Route and the Green Route, with a transfer point located at Liberty Plaza. Nearby: Convention Center Parking Lot, City Hall, Business 65/Veterans Blvd. See the trolley system map for details about all the stops. When do the trolleys run? January – February: The trolleys run weekends only from 10 a.m. – 5 p.m.
March – December: The trolleys run 7 days a week from 9 a.m. – 6 p.m.
Trolley service doesn’t run on Thanksgiving Day, Christmas Day or if weather conditions make travel dangerous. How can I tell which route a trolley is running? Each trolley is outfitted with a flag on the front of the vehicle, either orange or green. Look for this flag when you’re looking to transfer from one route to another. How long does it take to get around? How frequent are the trolleys? If you get on the trolley at any stop, that trolley will usually complete that route’s entire loop in 20-30 minutes. If you are transferring from one route to another, it might take as long as 45 minutes to get from Point A to Point B in some cases. But most of the time you can get around faster than that. For example, going from Main Street to Branson Landing usually takes 5-10 minutes. The trolley will wait at each stop for a moment before proceeding to the next stop. If you’re not standing at the curb when the trolley arrives at a stop, please move toward the stop and signal to the driver. You can find the nearest trolley by using our trolley GPS tracker. Can I just take the tour? Of course! We love to show off our beautiful downtown, and while you’re riding a video tells you about the area’s history and points out downtown attractions. Yes. The trolley system is paid for by Historic Downtown Branson merchants, so it is free for both visitors and locals. Our drivers do accept tips for good service, but tipping is not required. Yes. Each trolley is equipped with a wheelchair lift. Please let the driver know if you need any special accommodations. Yes. Service animals are welcome on Sparky. Please advise the driver of any other special needs you may have. Please note that pets are not allowed on board. There’s lots of great information about the trolley and the many things to do in Downtown Branson on our RideSparky.com website. You also can stop by the Downtown Branson Welcome Center at the intersection of Commercial and College Streets (Trolley Stop 12 is 1 block away) for free maps and brochures. If you need further assistance, you can call us at (417) 334-1548.